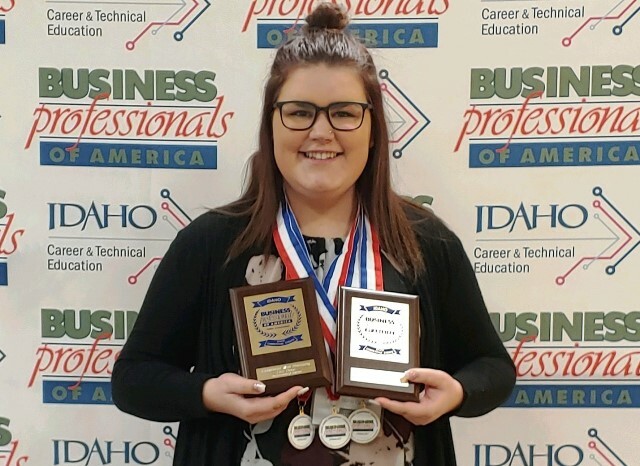 Pictured at the BPA competition in Boise is NIC student Kaylee Nelson, who took home two first-place awards and one second-place award. Second Place – Basic Office Systems and Procedures. Nelson competed with university and college students from across the state in business competitions through BPA, a national organization for high school and college students preparing for careers in business and career technical fields. With 45,000 members in more than 1,800 chapters across 25 states and Puerto Rico, BPA is an organization that supports business and information technology educators by offering co-curricular exercises based on national standards. Nelson has qualified for the national leadership conference and competition in Anaheim, California in May.